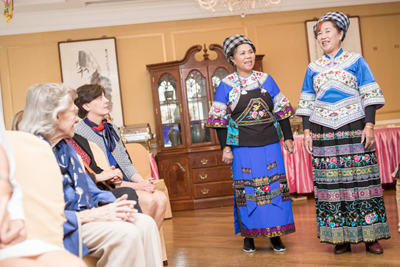 On September 12, 2017, Madam Hu Pinghua, wife of Ambassador Liu Xiaoming, hosted the Chinese Traditional Handicraft Tour themed "Interweaving Cultures" at the Ambassador's residence with a display of traditional Chinese handicraft. Xia Hua, Chairwoman of Eve Group and her team introduced and displayed the traditional handicraft of Buyi, an ethnic minority group living in the southwestern mountain areas of Guizhou, China. Present at the party were Lucia, wife of Jeremy Hunt, Secretary of State for Health, Amanda Thirsk, Private Secretary to HRH The Duke of York, Hilary Russell, wife of Sheriff of the City of London at the Central Criminal Court, Lady Sassoon, wife of Chairman of China-Britain Business Council, wife of Korean Ambassador, wife of Polish Ambassador and friends from other sectors. Madam Hu first delivered a speech. She said this was a chance to not only enjoy the close-up of the beauty of China's ethnic costumes and handicraft at the "Interweaving Cultures" display, but also appreciate two kinds of charms of integration. The first is the charm when tradition meets modern fashion. The display is about the traditional ethnic craftsmanship from Qianxinan Prefecture in China's southwestern province of Guizhou, where some 30 ethnic minority groups live, including Buyi and Miao. The diverse culture of these minority groups are highly appreciated for their long history and distinctive features. 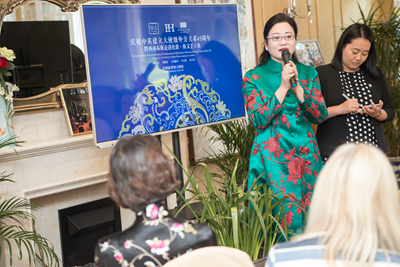 Madam Hu said, "Today, we are bringing these handicrafts out of China's remote mountains and giving them a stage in London and a path to the world. We are doing this because we believe anything that is distinctive to a nation can be universally appreciated around the world." The second charm is the combination of the traditional craftsmanship with the market, which should be accredited to the EVE Group and its China Craftsmanship project. Thanks to their keen entrepreneurship and marketing expertise, the ethnic cultures of Qianxinan, especially the traditional embroidery, have found a way to sustainable development. The China Craftsmanship project demonstrates the Chinese Government's commitment to cultural preservation, targeted poverty alleviation and mutual assistance between women. It is also an excellent example of China-UK cultural cooperation. Madam Hu said that this year marks the 45th anniversary of China-UK ambassadorial diplomatic relations. It is a year for consolidating the China-UK "Golden Era", and certainly a "Golden Era" for the cultural exchanges between our two countries. The Chinese Traditional Handicraft Tour in Britain is one of the outcomes of the ever growing cultural cooperation in recent years. She hoped that Qianxinan traditional handicraft would be passed on to future generations and be appreciated by more and more people around the world. 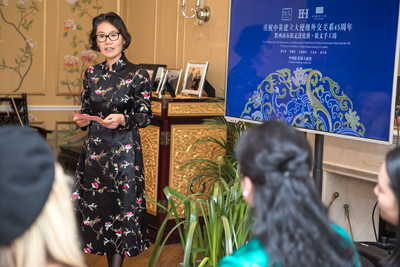 Ms. Xia Hua, Chairwoman of Eve Group and founder of the China Craftsmanship project briefed the guests on the original intention of her project and its progress. She told the story of how the project team members shuttled between cities and mountains for more than a decade to rescue and protect the traditional ethnic craftsmanship of Qianxinan Prefecture and implemented training and support schemes for "seamstresses". From the day they joined "Dream Weaving Workshops", 5,000 seamstresses began to make a living sewing with their own hands and obtained the ability to shake off poverty. Their new life enabled them to "carry a baby on their back, while weaving and embroidering to earn a living and support the family." Under the vigorous support of Ambassador Liu Xiaoming and his wife as well as the Chinese Embassy, with the joint efforts of Chinese and British partners, the Chinese Traditional Handicraft Tour in Britain enables the Buyi culture of Qianxinan Prefecture to come to the fashion city of London and show the beauty of Chinese craftsmanship to the world. On display at the scene were hand-made embroidery, clothing and patterns with rich and distinct ethnic features of Qianxinan. Four seamstresses from the mountain areas of Qianxinan Prefecture demonstrated the embroidery process on site and sang a Buyi ballad "Put on My Embroidered Garment Made by Mom" composed by one of the seamstresses. 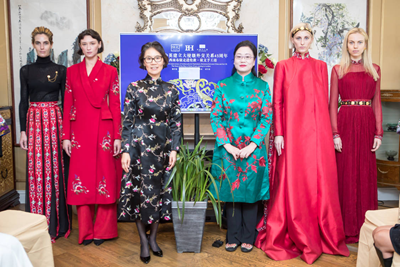 Four models wearing garments inspired by the handicraft design elements of Qianxinan displayed the beauty of blending Chinese and Western elements. The guests enjoyed pleasant conversations with the seamstresses and the designers and listened to the stories of seamstresses. They marveled at the integration of the traditional Chinese ethnic minority handicrafts with modern fashion, and spoke highly of the Chinese Government's commitment to targeted poverty alleviation and the cultural and social significance of the China Craftsmanship project. They expressed their thanks to the Chinese Embassy and Madam Hu for hosting this traditional Chinese culture event and displaying the outcomes of China-UK cultural exchanges, and hoped to participate in more such meaningful events in the future.